I absolutely adore this comforter!! Not only is it a gorgeous color but it looks awesome on my bed and is so comfortable and warm. EXCELLENT purchase! Upgrade your bedroom decor with this Cheer Collection baffle box comforter with hypoallergenic down-alternative fill. Stuffed with 100-percent polyester microfiber, this comforter delivers lightweight warmth and comfort while allowing those with allergies to sleep easy. Available in a variety of colors. We like the reversible for the different colors. This is warm but very heavy to lift. (We got the king for our queen bed because the queen size is for a double or a queen and it seems small for a queen) It is not heavy to sleep under it but to make the bed or take the comforter off, it's pretty weighty! The comforter is exactly what I expected and what I wanted. It is lightweight but warm and carefully sewn. The color matches what is shown on Overstock's website. Needed to replace my comfortable and picked this because I liked the colors. Very pleased. Colors are as shown, the material is very soft and the comfortable is not heavy; very light. Have not tested how warm this is yet, still summer here and no need for warmth. Pleased with this purchase. Very pleased with this comforter because it is very comfortable being lightweight but magically keeps us warm, just right. Really like the pale relaxing sage and grey colors and Love that when you want a different color you can just flip the comforter over being reversible, easy change to your bedroom. It is softer than I expected it to be which was a very nice plus. It is machine washable but we may have to take to laundry mat if our washing machine isn't big enough to wash well. Regardless, it is a really good quality and very comfortable at a great price. This comforter is really pretty nice. It is warm (in my opinion too warm for summer use), it's a nice subtle color (I got the sage), it's soft and comfortable. But what I REALLY like about the comforter is that the dimensions actually work on a king size bed. I have gotten too many comforters in the past that just aren't quite large enough to cover the bed. This one is wide enough and long enough on the bed. These are good quality and perfect for our guest bedrooms for this winter!! The colors are great, recommend this comforter, if REAL down comforter is not affordable. I love this reversible comforter. This product feels really excellent against your skin. When washing this product it does not destroy the material. It ends up the exact way when you first purchased it. I would really like to buy this comforter in another color. You can also use this in the summer. It flows with the any type of weather. I would highly recommend this product to my friends and family. 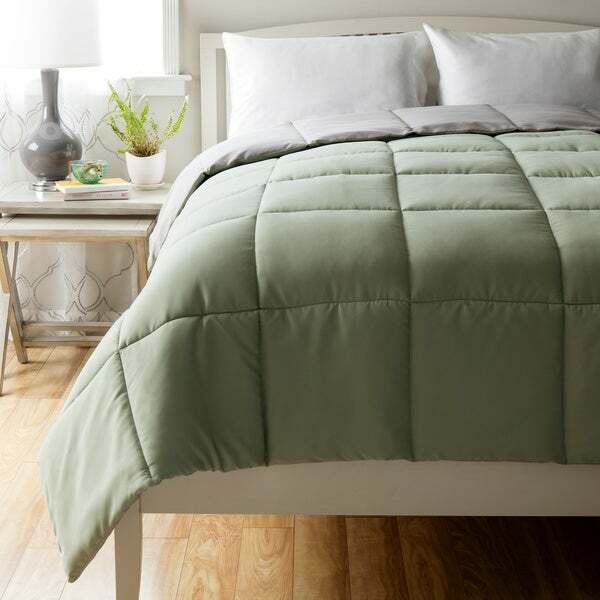 Love this comforter – lightweight, nice fabric and color, warm and cozy. Very good price for this quality item. Can't beat Overstock's comforter deals. Recommended! Arrived VERY wrinkled. Just wrapped in plastic, no box. I bought a king for a queen bed. Still will have to use dust ruffle, but my bed is very high. After 3 weeks on the bed, remains wrinkled for the most part. This is a very comfortable comforter and you definitely get your money’s worth! I would recommend this product to anyone looking for a warm and incredibly soft comforter. Amazing! Bought this for my 16yoa son Xmas 2016. Today has no pills and looks new after my washing. Threads are still in tack. The material is soft and clean. Love it! I love it, it's soft and lightweight but keeps me toasty. It is the ultimate curl up and snuggle. It's also very easy to wash (I don't have a center agitator) and dry. This is a very soft lightweight comforter that is a little extra length and width to adequately cover a king bed. I love the look. I added it to my guest bed for a little extra warmth in the winter but in the summer I will cover it with a duvet and I think it will be a perfect summer weight. I bought two. One for my daughter and one for me! Fluffy and nice! Love this comforter!!!! Durable and not too hot for the summer nights. Also washable which make it easy to keep clean and looking fresh. A great buy at an awesome price! Perfect thickness and color! Would definitely buy another. I like these comforters - they work for winter or summer. "What are the measurements for a queen sized and a king sized?" The measurements are as follows- Full-Queen: 88 inches wide x 90 inches long King: 96 inches wide x 108 inches long. "I thought it was free shipping? Is that incorrect?" I was looking for a darker sage and this appears to be correct. I am trying to match bolsters which range from dark to light sage with a tan background. Since my major bedroom colors are teal, I think dark sage will blend in better. My bed is Queen but since this is comforter-sized (I assume) so I bought king. The price is low enough so that if this doesn't work the way I want it to, I can give it to charity. "Can this be dried in the dryer or does it have to be air dried?" Tumble dry on low setting can be used.